Home MTAANI NEWS Angry residents blame fire brigade as car is reduced to a shell as they watch. Angry residents blame fire brigade as car is reduced to a shell as they watch. Scenes of the very unfortunate fire incident outside the Kiambu Huduma Centre in Thika where Kiambu County Government's disaster management preparedness were put into question. Friday, September 22, 2017, will forever be etched in the memories of Michael Karanja, an employee of Mt. Kenya University as hi Toyota 96 station wagon was reduced to a shell as he watched. 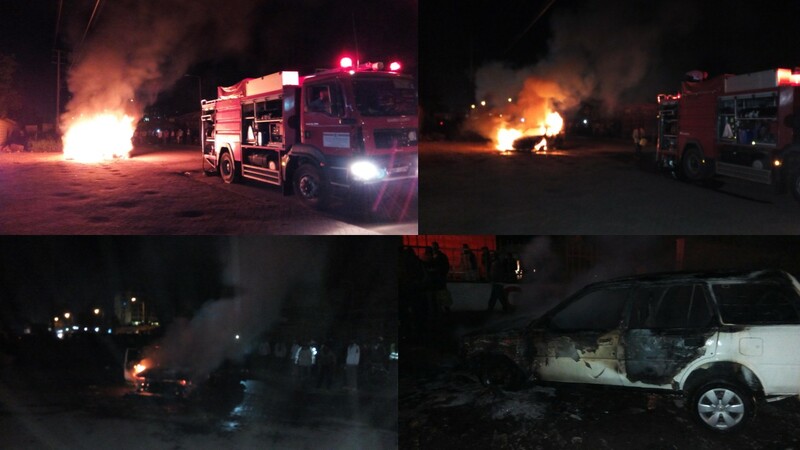 A section of Thika residents blamed the Thika Sub-County fire brigade for their inactivity as the car burst into flames as they helplessly watched. While speaking to the press, Charles Musila acknowledged that even though the firemen responded to the incident in good time, but it was very unfortunate that the fire engine failed to launch water to put off the fire, forcing them to use buckets and other containers gotten from the neighbourhood. “What was the use of them coming here if they knew that their engine could not launch water? In fact, were it not for them restraining us from putting off the fire with soil, we would at least have saved part of this car,” said Musila. He added that it was very sad and unimaginable to see fire fighters resulting to buckets to put off a fire of that magnitude whereas Thika was in record having four fire engines from the county government. Otherwise, a source close to the department of fire notified us that two of the fire engines had been grounded while the remaining two were malfunctioned and could stall too anytime. “There is either negligence or some kind of sabotage by someone or some people in the county government because other than the fire engines, most of the county government vehicles are lying idle in the yard for various mechanical problems. Some of the other worst hit departments are in the garbage collection where so many of their tracks are grounded,” explained our source. A speechless Karanja could not hide his shock and disbelieve over the sad turn of events. He said that, prior to the incident, his car had no history of malfunction and it took him by surprise when he noticed some funny smell as he approached the Thika Sub-County Stadium roundabout. “I have just arrived from Engineer (Nakuru County) to attend a burial and I was about to drop my friend just a few metres from here. It is then we noticed some funny smell from the bonnet and decided to pull over to check,” said Karanja. No sooner had they pulled over had the engine burst into flames. With the help of some members of public, he pushed the vehicle away from the stadium stalls to the parking yard of the Kiambu Huduma Centre. Some members of public helped him to put off the fire using soil as they awaited for the fire brigade to arrive. On arrival, the fire fighters are alleged to have ordered the people to get aside to give them room to put off the fire but their engine failed, forcing them to use buckets to put of the fire. By the time the second engine arrived, the vehicle had already been reduced to a shell by the fire.